Disclaimer: This story is focused on how I identified and removed the sponsored posts, not on why I removed them. It’s an occasion to learn more about the DOM. 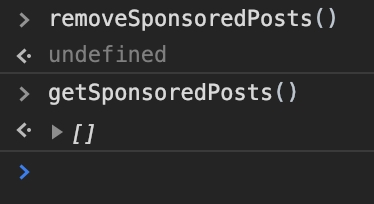 Today I open Facebook, and I notice something, my adblocker isn’t working.As a developer, I decided to investigate, and first thing first I inspect the structure of these sponsored posts, to see if there’s a way to identify them so I can remove them with a script. 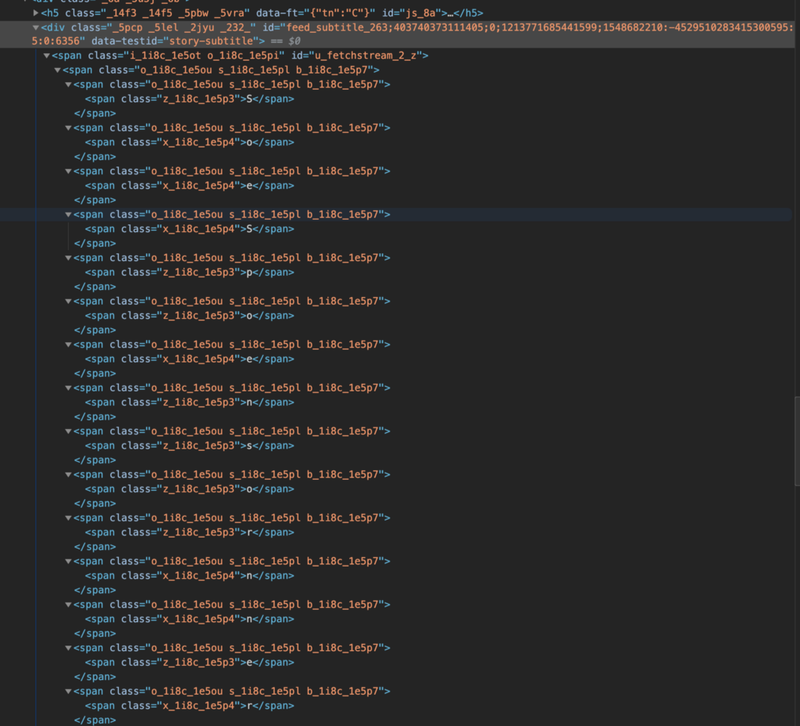 The structure looks pretty simple, we have an element with role “article”, that contains a div with a class starting with “feed_subtitle”, and inside this last div, something like a bazillion of spans with random words.Dude, seriously, WTF? They are using a trick to display the word “Sponsored”: some of the spans are visible, some aren’t. And to make things simpler… sometimes the parent is visible, but the child isn’t, and vice-versa. Well, this was kind of expected, we need a function to find what is the real text if we want to remove these ads. To do this, we need a recursive function; the function will obtain a list of the child nodes of the element and remove the ones that are hidden. The DOM is a big tree of nodes, the elements that compose the page, are usually of type “Element” and “Text”, is important to notice that each different node type has a different set of child nodes allowed. The document node (the root) for example can have as a child a DocumentType node while the other nodes can’t. The elements that compose the post, are all under a node of type Element, this means we can find only these types of nodes: Element, Text, ProcessingInstruction, and Comment. [Specification]. We don’t have any interest in Comments and ProcessingInstructions, because they are not rendered by the browser. For this reason, we filter them out. Then, with these visible nodes, we collect the nodes that are visible inside them. But we have a problem if we get the nodes of the elements recursively. The ones at the end (the leaves) will not have any nodes. We need to stop when we reach an element that contains only text and return what we are interested in, the text content. Perfect! Now we have everything for our recursive function, the recursion cycle and the stop condition, let’s merge all the pieces. Now, we need to have a function that just says “yes” or “no” when we ask if that is the subtitle of a sponsored post.And just for security, that it works even when the subtitle is missing. Now that we have a way to know when is sponsored, we just need to obtain all the sponsored posts on the page. Now we need a function to remove these articles. Now it’s missing only one piece, remove these posts before I can see them. There are for sure a lot of smart ways to do that, but I’m very lazy, so I will simply use a function to observe all the new DOM elements added to the feed.To do this I can use MutationObserver, this useful feature can execute a callback every time an element is added or removed from the subtree of a specific element. When we create a new MutationObserver, we pass to the constructor a callback that will be executed when a change happens on the element we are observing. The changes that we can be notified of are chosen on the observe method that we will see later.We will get notified of these changes with a mutationList, a mutationList is a list of MutationRecord that happen on that Element, there are 3 types of mutations we can be notified of: “attributes”, “characterData” and “childList”; Each of these mutations describes what is changed, for example, a MutationRecord will be of type “attributes” if one or more attributes of that Element has changed. Creating a MutationObserver isn’t enough, we need also to make it observe an Element, after creating it, we can use the method “observe”, this method takes as arguments the Element to observe and what observe. We can observe changes on attributes of the Element, and/or changes on the hierarchy of the Element (new nodes under the Element added or removed). We are interested only in the mutation of type “childList” (children added or removed), and we want only the ones where at list one child is added. Of these mutations, we are interested only on the nodes that are added, so I extract them out. Of the nodes added, we are interested only in the posts ones. Finally, I call the observe method to check for changes on the childList, and I’m interested in the entire subtree (not only the direct children of the Element). Perfect, now we have a list of every post that is added to the page! Now the only thing that is remaining is to put this code in action automatically every time I open facebook. How I got rid of the new sponsored Facebook posts. was originally published in Hacker Noon on Medium, where people are continuing the conversation by highlighting and responding to this story.